WILL deflation and depression really happen? WHAT causes deflation and depression? CAN the Fed prevent deflation? WHERE can you find the few exceptionally sound banks, insurers, gold dealers and other essential service providers that can help you protect your wealth? HOW should you arrange your finances and your life in order to survive the depression, prosper while it's happening and take advantage of the unprecedented opportunity coming at the next major bottom? Not one in ten thousand investors will think to ask these questions, even as their financial institutions may be lurching toward insolvency. "CONQUER THE CRASH will answer these questions... and more." "Conquer the Crash outlines brilliantly and simply the rationale for how and why the bubble developed. Prechter will go down in history as a legend for having predicted the secular bull market and now having provided a lucid description of the economic cataclysm that unfortunately lies ahead. 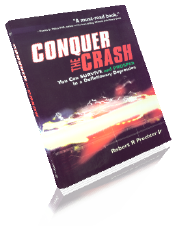 I urge you to read Conquer the Crash and give it to your loved ones. It provides great tactical advice on how to prepare yourself financially. Reading this book could make the difference between agony and comfort over the next 20 years." Conquer the Crash is packed full of practical and pertinent facts. Robert Prechter is President of Elliott Wave International (EWI), a forecasting firm servicing institutional and private investors around the world. EWI provides long-term as well as intraday analysis on stock markets, currencies, interest rates, commodities and social trends. Since 1978, Prechter has published ten financial books which have been translated into as many as a dozen languages. Every month, he writes thoughtful market commentary in The Elliott Wave Theorist. He is currently developing a new Web site dedicated to the elucidation of what he terms socionomics, the new science of social prediction. Prechter attended Yale University on a full scholarship and graduated in 1971 with a degree in psychology. He began his career as a Technical Market Specialist with the Merrill Lynch Market Analysis Department in New York City. "Bob Prechter's new book, Conquer the Crash, provides a wealth of self-help do's and don'ts. It's a must-read book, which I'm personally putting on my gift list for friends and loved ones." 2: When Do Depressions Occur? 3: When Do Stock Markets Turn from Up to Down? 9: When Does Deflation Occur? 11: What Makes Deflation Likely Today? 13: Can the Fed Stop Deflation? 15: Should You Invest in Bonds? 16: Should You Invest in Real Estate? 17: Should You Invest in Collectibles? 18: Should You Invest in "Cash"? 20: Should You Speculate in Stocks? 21: Should You Invest in Commodities? 22: Should You Invest in Precious Metals? 32: Should You Rely on Government to Protect You? 33: A Short List of Imperative "Do's" and "Don'ts"
"Conquer the Crash provides disciplined investors with a map, compass and survival guide. Don't leave home without it."